He never saw the trip wire. US Army Private Vincent Mannion, hunting for insurgents near Tikrit, Iraq, on March 11, had just kicked down a steel gate when a booby trap made of two large mortar shells detonated. A storm of shrapnel, incinerating heat, and a concussive force brought the cinder-block structure down on top of him and Sergeant Daniel Woodcock, his team leader in the 82d Airborne Division. Woodcock was killed. Mannion, a 19-year-old who grew up in West Roxbury, sustained deep shrapnel wounds to his arm and torso. He was unconscious, but alive. The more devastating injury was not yet visible. The blast wave had rumbled through his brain, a sudden shock of high pressure then low that severely damaged his cerebral lobes while leaving his cranium - and the Army helmet meant to protect it - intact. He had suffered the signature wound of the war in Iraq: traumatic brain injury, or TBI, which has been diagnosed in nearly 3,000 veterans of Iraq and Afghanistan. But if Mannion's devastating injury is tragically common, his case may prove critical to other wounded veterans across the country. His family has joined and inspired a budding movement demanding specialized care for severe TBI patients in private facilities outside the military and veterans healthcare system - a system that many families of veterans, and some leading medical specialists, view as badly overtaxed and no match for the nation's best rehabilitative hospitals. It is a step the military has sought to avoid and the Department of Veterans Affairs bureaucracy has adamantly resisted, because of fear of the cost of private care and pride in their own facilities and staff. Mannion is the first New England soldier to win approval for private hospital care for severe TBI - in his case, at Boston's Spaulding Rehabilitation Hospital - and it only came after an intense campaign by his family. For the soldiers, and their families, it is a quiet rebellion born of desperation - and a belief that the nation owes the very best care, regardless of cost, to those who have made such a sacrifice. "At a time of war, he went out there to fight for his country. So I am going to fight for him. It's our mission to make sure he gets the best care he can get," said Mannion's mother, Maura, adjusting a blanket with an 82d Airborne Division insignia on his hospital bed at Spaulding and delicately patting the hair near the indentation on the left side of his head. Her motherly insistence is perhaps no surprise. But her belief that Mannion's best shot lies with treatment at Spaulding, rather than in a Veterans Administration facility, is reinforced by medical specialists, some from within the military system, who believe the crush of TBI cases necessitates a turn to the private health system for expert help. Lieutenant Colonel Rocco Armonda, a surgeon at Bethesda Naval Hospital who is considered among the world's leading specialists in TBI cases, is among those who think the expertise of private hospitals should be more freely available to veterans with TBI. Armonda said it isn't that the VA centers are not capable of providing excellent care; he refers many of his patients to them for rehabilitation. Rather, he said, the VA doesn't have the capacity or - more important - the institutional culture to handle the current onslaught of complex cases. "It doesn't mean the people at the VA are not good people. It means they don't have the resources and to some extent they are not part of a culture that seeks to create excellence," said Armonda, who was the lead surgeon in Mannion's case. "In my opinion the problem at the VA is that it is run by administrators and not doctors." Armonda said it is wrong to require families to mount exhausting case-by-case battles for private care, as Mannion's family and others have been forced to do. "We're a nation at war, not just a military at war. Why not mobilize the nation's resources in every way we can? Who foots the bill is the question that holds that up. But we should realize if we don't foot the bill now, these patients and our system will pay more later," Armonda said. Armonda's view is underscored by Dr. Heechin Chae, Mannion's primary physician at Spaulding. "Currently, the VA system cannot manage patients with TBI," Chae said. "The physicians in the military, at least those who I've spoken to, are eager to send patients to private hospitals like Spaulding because they realize that the VA system cannot provide the specialized rehabilitation for soldiers with TBI." VA officials reject such criticisms, saying they have the necessary capacity and expertise. To cope with the dramatic surge in serious TBI cases, the VA has moved to upgrade four acute rehabilitation wards into "polytrauma" treatment centers. Dr. Barbara Sigford, the VA's national director of rehabilitation, says the centers are in some ways more equipped than the private sector to handle the needs of veterans wounded by improvised explosive devices in Iraq and Afghanistan. The four centers have handled approximately 450 severe TBI cases since the start of the war in Iraq. Sigford added that the VA has supplemented the four centers with 17 outpatient trauma facilities in cities across America, including Boston, where more moderate TBI cases can be treated. TBI is a complex injury with a wide spectrum of symptoms, from complete and permanent cognitive malfunction to depression, anger, and confusion in more moderate cases. Chances for recovery vary widely. The military recently received a mandate from Congress and a presidential commission to carry out more aggressive screening for TBI among returning combat veterans - screening that could significantly boost the number of known TBI cases. A VA study released last year contends that the VA's care in TBI cases is in line with that of private hospitals, Sigford said, adding that the agency would continue to resist paying for private care when appropriate VA facilities are available. Care over a lifetime for patients with severe TBI is estimated to cost as much as $17 million or more. But the VA study, conducted by the agency's inspector general, also highlights the shortcomings of the VA's rehabilitation care, particularly as patients from the military medical system are transferred to the VA, which deals with service members after they are discharged. It also cites a lack of coordination of long-term care for TBI victims. Some families of wounded soldiers attest to the system's limitations. They say the VA's polytrauma centers in Minneapolis, Palo Alto, Calif., Tampa, and Richmond lack the latest equipment and technology and are too geared toward geriatric veterans from World War II and long-institutionalized patients from Vietnam. They are not, these families insist, the right place for young combat victims whose brain trauma can in many cases be reversed through an aggressive regime of rehabilitative care and cognitive therapy - particularly during the critical early days after surgery. Specialists in both private and military settings agree, saying the VA's centers were thrown together too quickly and that the agency failed to tap the expertise of top-flight private facilities in designing them. As a result, the centers generally are not regarded as top-tier. "Are we cutting corners to cut costs?" Armonda said. "I think I have to say I am hearing from the families that there is a problem there." The Globe interviewed seven families across the country who have joined the battle to force the VA to allow and pay for private care. Most have experienced VA facilities up close and are remarkably consistent in describing the system's shortcomings. A common concern is understaffing, which several families allege has led to poor sanitation, infections, and what they consider patient neglect. Craig Chambers is the father of Marine Lance Corporal Brian Chambers, who was in the same intensive care unit at Bethesda Naval Hospital as Vincent Mannion during many weeks of recovery. He said he had accepted the VA's plan for his son to go to the Tampa VA facility for rehabilitation, but it did not go well. Brian's wounds were re-infected, resulting in a considerable setback. "It wasn't great, to tell you the truth," Chambers said of his son's six weeks at the Tampa TBI center. "There are some good people there, for sure, but understaffing is a real issue. The system is just sort of behind the eight ball. And you get tired of that. You want the best and you don't really feel like you're getting it." The family is pushing now for Brian Chambers to be cared for at a private facility near their Colorado home. "We're going to fight hard not to go back there," said Craig Chambers, referring to the Tampa center. The Ryan family from New York's Catskills region is also caught up in the fight. Marine Corps Private Eddie Ryan was shot in the head on his third tour of duty in Iraq on April 13, 2005, sustaining severe TBI. 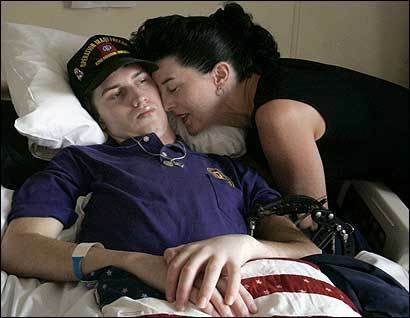 His parents, Angela and Chris, both praise the care their son received from military surgeons. And when Ryan was transferred to the VA's polytrauma center in Richmond, they said they went with a positive attitude. But they were quickly disillusioned. Angela Ryan describes the Richmond VA facility as "very poor" and the staff as stretched thin. "The conditions on the floor were horrible. It was dirty. Our son developed a bedsore from not being moved enough and then it became infected," said Ryan, who quit her job as a lunchroom aide at a nearby elementary school so she could be by her son's side. She stayed in a hotel room paid for by the Marines. "I came one day and found my son sitting in his own feces," she added. "The nurses would not allow us to change him because of the IV and the monitors. So he was made to just wait. . . . They made him wait an hour and a half. . . . We knew we had to get him out of there." While tending to her son, she watched other patients struggle as well. She said she often saw TBI victims left for long stretches in the hallways with meal trays in front of them. She said she watched them get thinner and regress. Asked about the complaints by the Ryans and others about nursing shortages and unsanitary conditions, Dr. Lucille Beck, the VA's chief consultant for rehabilitation services, said she could not address specific cases. But, she said, "In today's hospital system, every institution faces shortages. Every hospital is looking at how do we deal with that." After four months at the Richmond VA, Eddie Ryan was transferred back to Bethesda for a surgery and the family fought hard for his transfer to a private facility, ultimately succeeding. He is home now and receiving physical therapy there through a private con tractor paid for by the VA.
Then, last month, the VA said it planned to cut his rehabilitation from five days a week to three. Once again the family mounted a public battle, and once again it won. "You have to be willing to fight like hell," said Angela Ryan. By far the biggest complaint from families is that accepting care in a VA polytrauma center means driving long distances or temporarily relocating the family to living quarters provided by the VA. The families call this an unfair burden and a disservice to wounded veterans who thrive on a support network of family and friends. Sigford, the VA's national director of rehabilitation, provided the Globe with a tour of the Minneapolis VA's polytrauma rehabilitation center and the temporary residence provided for families of veterans. She and other staff members said that some of the complaints from families grow out of a sense of frustration with the long and difficult road to recovery for veterans. She said the system also catered to WWII veterans, but added that many veterans welcome the relationships that form between the generations and see it as an important aspect of healing. The staff at the facility also responded to family complaints about the lack of state-of-the-art equipment. Workers said they have, for the most part, the equipment they need, and that the VA is moving quickly to replace some aging gear. Even after months of treatment, Vincent Mannion can barely communicate most days, even with his eyes. But his doctors and family say his recovery has nonetheless been remarkable, given the severity of his wounds. But keeping him at Spaulding may require a further struggle. His five months at the hospital have been covered by the military's insurance system, known as TRICARE, but he probably will soon be discharged from the system - or "med-boarded" as the military puts it. Then it is up to the VA to decide whether to continue his private rehabilitation, and the VA has previously signaled to the family that he should go to the Tampa TBI center. The family anticipates a struggle, but in their determination and savvy about the military healthcare system, they stand apart. Mannion's father, Jeffrey Brodeur, is an Army veteran who was wounded in Korea. He has faced his own struggle to get benefits from the VA and knows the system well - both as a patient and in his service as national director of the Korean War Veterans Association. Vincent Mannion's mother served in the Navy and worked for three years at the VA until she quit in 2002 after witnessing what she describes as "a broken system." "When you are in the hands of the VA, you are gambling," Brodeur said. "And I'm not going to gamble with my son's care. Not after what he went through." Such case-by-case battles should be a thing of the past, Dr. Armonda of the Bethesda Naval Hospital believes. It is time for Congress or the VA to make the system more rational, and face up to the need to turn to private care - or increase partnerships with private facilities - in many of these intractable cases. "How that's going to get resolved is a real question now," he said. A presidential commission appointed to look into how the military and the VA are serving the needs of wounded veterans highlighted the need for better TBI rehabilitation and encouraged partnerships with the private sector. Federal legislation passed unanimously by the Senate last month also called for such partnerships. But the families have seen such sweeping mandates issued before in Washington, while the VA consistently proves resistant to change. To Marilyn Spivack, the founder and former president of the Brain Injury Association of America and currently outreach coordinator for Spaulding's TBI rehabilitation, the debate seems painfully familiar. She says military families are finding themselves in the same crisis that civilian families seeking treatment for TBI have encountered for decades. She says there is a lack of understanding by insurance providers of how TBI is best treated, and a resistance to covering the huge cost of reclaiming these damaged lives. Spivack, who is from Framingham, has the long view on TBI. Her daughter, Deborah, sustained a severe brain injury in a car accident 32 years ago. Ever since, Spivack has been a fierce advocate for TBI victims, and she's now turning her attention - and her expertise - to the needs of veterans. "The extraordinary levels of care required and the burden of costs to provide the care have just not been factored into this war," she added. On a recent summer afternoon, Brodeur had made his daily drive from Hyannis, where the family has lived year round for the last two years. He spent hours with Vincent Mannion, strapping on the white helmet with a purple heart decal and giving him words of encouragement before a physical therapy session. Mannion must wear the helmet daily to protect his fragile skull. During his therapy, two women worked with him on bending his arms and legs for one hour on a padded table and then they helped him take tentative steps down a long corridor. Later Mannion, who was once a high school football star, worked with the occupational therapist who was patiently - if not very successfully - helping him to eat from a spoon. He stared back at the therapist and his father with a fierce gaze that was difficult to gauge. Mannion is unable to talk. He communicates by blinking, and occasionally blurts out a phrase. The extraordinary patience and professionalism of the staff and the sense of intense focus on Mannion's needs are what Brodeur feels sets Spaulding apart. Later that day Brodeur drove home to Hyannis, where FedEx had just delivered five footlockers containing Mannion's personal effects from the war. He snapped the buckles on the footlockers and pulled out his son's uniform, which was still caked in the dirt and blood from Iraq. There was also a Purple Heart, and photographs of the forbidding terrain Mannion's unit was patrolling when he was wounded. Brodeur sat at the kitchen table with the footlocker open before him and said, "I'm from a military family going back generations for more than 100 years. I am a veteran and my wife was in the service as well. I think service is every American's obligation. Freedom is not free. I'm proud of my son and his service. And I want him to be proud of how his country took care of him when he was injured. I am going to make sure he's taken care of."